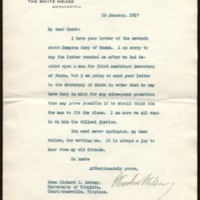 Woodrow Wilson writes to Richard Heath Dabney about considering Hampson Gary for a position in the State Department. I have your letter of the seventh about Hampson Gary of Texas. I am sorry to say the letter reached me after we had decided upon a man for Third Assistant Secretary of State, but I am going to send your letter to the Secretary of State in order that he may have Gary in mind for any subsequent promotion that may prove possible if he should think him the man to fit the place. I am sure we all want to do him the fullest justice. You need never apologize, my dear fellow, for writing me. It is always a joy to hear from my old friends. Wilson, Woodrow, 1856-1924, “Woodrow Wilson to Richard Heath Dabney,” 1917 January 10, WWP20516, University of Virginia Woodrow Wilson Letters, Woodrow Wilson Presidential Library & Museum, Staunton, Virginia.